A power surge is very brief spike of electric current, lasting less than a thousandth of a second, that can cause damage to your home. According to TecHOme, about 80% of power surges originate from inside the house from high-powered appliances. Electric company maintenance and lighting strikes to power lines can also cause destructive surges. Protect your electronics, and most importantly your family, by purchasing some form of surge protection for your home. Energy surges can happen at any time and without warning. Additionally, if you own an older house, power surges are probably happening without your knowledge. Low energy surges happen cumulatively over time. They will not cause something to immediately blow out, but they will continually degrade home equipment. Basically, an appliance that usually lasts ten years may stop working after only five. With a surge protector in place, you can protect your home circuits and appliances from damage if they are hit with too many amps. Many people use power strips as a basic form of surge protection. 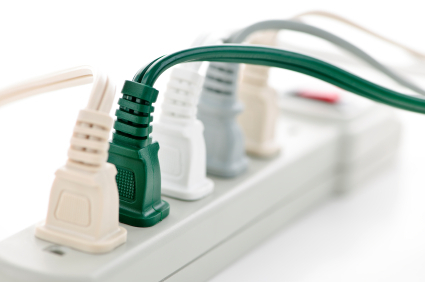 Placing power strips between electrical outlets and major appliances can be a great way to protect them. However, it should be noted that not all power strips offer surge protection, so you need to pay close attention when purchasing a product. Service entrance surge protectors are the largest and most durable type of protection. They have to be installed before the main breaker on your house. Power leaves the main distribution transformer, enters the surge protector, and then flows to your main breaker panel. Whole home surge protectors can be installed inside your home’s main breaker. They can be configured to protect a single circuit or all of the circuits in a home. They guard against both larger surges as well as smaller ones, depending on the type and model. Call a professional for help with surge protection. At Tim Kyle, we offer an electrical energy audit for Baltimore County, Maryland homes and residences in the greater Baltimore area. By examining your appliances and other energy-hungry electrical sources in your home, we can help develop a strategy for surge protection, safety, and cost savings.